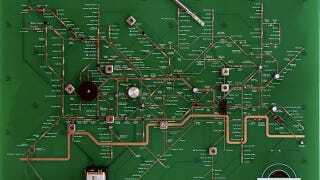 Though it might look a lot like your typical circuit board on first glance, this board designed by Yuri Suzuki actually hides the London Underground Map in plain sight. As you look closer, you'll see all the resistors and components matching up to re-create the London Tube. By strategically positioning certain speaker, resistor and battery components throughout the map, users can visually understand the complex networks associated with electricity and how power is generated within a radio.